"Thank you to Jimmy & the Decorative Concrete Expert team. We were looking for a solution for our patio that was both classy and functional. I can't thank you enough!" 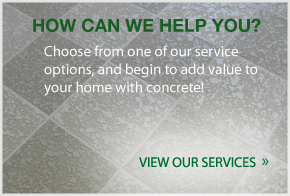 -Teresa N.
“Thank you to Jimmy & the Decorative Concrete Expert team. We were looking for a solution for our patio that was both classy and functional. I can’t thank you enough!” -Teresa N.
Don’t put off getting your pool deck redone! At the Decorative Concrete Experts, we get very busy this time of year and are often asked if we can complete a job before a major holiday. The call volume goes up a week before Spring Break, Easter, and Memorial Day. The problem is that we are generally scheduled out for two to three weeks. Additionally, some pool decks take almost a week to complete. With just about every service that we offer excluding a simple repaint, the deck needs to cure for as much as five to seven days before heavy use. We stay very busy because we do great work at a fair price. If you do have a tight deadline, we will do our best to complete the pool deck in the time alotted, but we can do a better job and work with less stress by scheduling the work well in advance. Don’t get stuck with a contractor that isn’t busy for good reasons. With that said, we have a crew out today on a pool deck repaint that was signed yesterday so that the customer has the area ready for an Easter party next weekend.